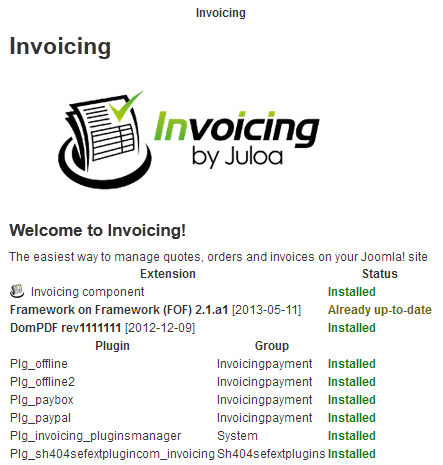 Invoicing has been developped to be compatible with the three supported versions (LTS) actually by Joomla! (1.5,2.5,3.x), if you have issues updating your version, let us a message on our forum in the Invoicing Support part. How to download Invoicing ? Click on "Products - Invoicing" in the top menu of this page then click on the link at the bottom of the page to access to the form which will allow you to register and buy Invoicing. Once invoicing has been purchased and downloaded, the component can be installed like any other Joomla component. If you have purchase a sivler or gold pack of AdsManager, to access the zip folder of Invoicing, you need to unzip the file you just download, the component will be inside it.